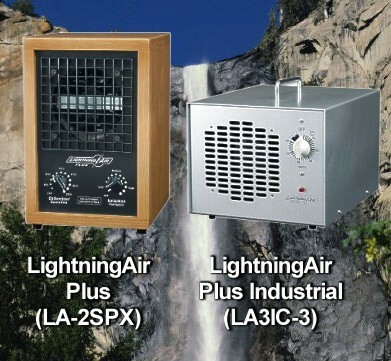 Lightning Air purifiers for a healthy living environment. Ozone and Ionic Purifier in one System! The LightningAir is not a filter. Instead it re-creates the same process that Mother Nature uses to keep the air fresh and clean. It generates the negative ions that nature uses to clear the air of dust and other particles. It also produces activated oxygen to remove odors without the use of fragrances. It helps to break down mold, mildew and other pollutants at their source. As air passes through a filter, small particles that are floating in the air are trapped. This is helpful in reducing particles such as dust, pollen and dander, but is only part of the solution. Most gases and odors pass right through even the best Hepa filters. LightningAir has the answers! Nature has many ways to produce activated oxygen, a natural air cleaner. For example, weve all taken a walk after a thunderstorm and experienced the clean, fresh smell in the air. Thats ozone, or activated oxygen, at work. Normal oxygen O2 is converted to O3, which is commonly called ozone or activated oxygen. O3 will break down odors and other contaminates. 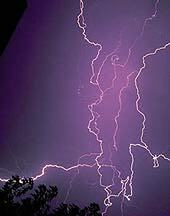 The LightningAir employs a separate O3 generator to achieve this natural process. Have you ever walked into someone�s home and noticed an odor that you are not accustomed to? Odors are constantly created in the spaces where we live. Finding a simple solution to clean air is not always easy.